Conventional wisdom and most national statistics have long treated the productivity of the government services sector as entirely flat. Only a tiny literature considers what actually happened to productivity at the organizational level. In this article, originally posted on the LSE’s British Politics and Policy blog, Patrick Dunleavy and Leandro Carrera draw on their pioneering book, arguing that we need to radically rethink our attitudes. We should begin adjusting to a public sector where intelligently implemented digital changes and services reorganizations can rapidly increase productivity over time. Consider four snapshots of (almost) automated government. Across the arid mountains of Afghanistan a jeep is tracked by a pack of eight drones, some for reconnaissance and others UCAVs (unmanned combat air vehicles, ‘killer drones’), controlled by two pilots sitting thousands of miles away in a darkened hangar in California. In the late evening a crowd of suntanned package holidaymakers arrives in an empty airport immigration hall, where most begin filing through automated gates equipped with technology to recognize their ‘chipped’ passports and conduct instant facial recognition analysis. As rains pour down, and river levels across a watershed rise to flood levels, an environment agency control room registers the patterns reported in wirelessly by dozens of automatic meters, using them to despatch teams of workers to the most critical situations. Across the UK in the last week of January tens of thousands of people click to ‘submit’ their online self-assessment tax forms, before groaning at the overdue payment shown and reaching for their credit cards to begin the payments process online. These vignettes are each tiny slices of a wider process that is now well underway in the advanced industrial states like Britain and the USA, the development and deployment of ‘zero touch technologies’ (ZTTs) throughout government systems. Essentially this means that functions which previously required human presence or direct control by a member of staff can now be extensively or fully automated, usually by digital means. As with every industrial revolution before it, the key development underlying the current changes is an increase in the scale and significance of capital investment and technology in government services, and a reduction in the role of labour – a process that economists call capital intensification. The rise of this robotic state has begun to accelerate in recent years as the potential of fully digitizing administrative processes has begun to be recognized and as austerity pressures spread and embed for the long term through the western world. Fully automated functions are now mainstreamed within the government apparatus in the UK. Four fifths of self-assessment tax forms now come in online. And the productivity benefits realized can be very extensive, holding out the promise of halting (perhaps even reversing) previous decades where the relative prices of public services have tended to rise, because government services productivity lagged behind that of advanced private sector industries (often called the ‘Baumol effect’). 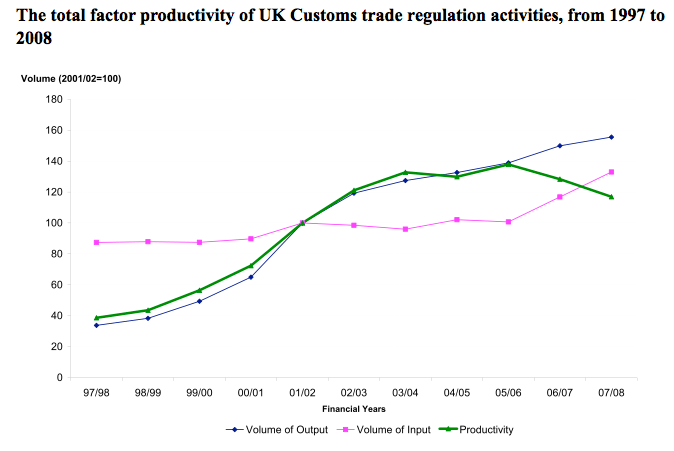 Consider our Chart below, which shows the overall productivity of trade regulation activities carried out by UK Customs staff across a decade. The horizontal axis here shows time (financial years) and the vertical axis shows an index number for ‘total factor productivity’. The inputs line here shows an index of the amount of labour, contracted services, buildings and capital costs spent by the Customs regulatory part of what is now HM Revenue and Customs – these costs are pretty stable across the period, especially because Customs labour force was virtually static. The blue line shows an index for the amount of imports and exports processed, which grew progressively for most of the period, turning down only in 2007. The thick green line shows the key index for Customs productivity, defined as outputs divided by inputs. Source: Dunleavy and Carrera, Growing the Productivity of Government Services, p. 70. The productivity growth shown here is very substantial. Across most of the decade Customs handled more and more trade volumes with the same numbers of personnel. This achievement reflected the agency’s committing to a new IT system for handling imports and exports paperwork digitally in the mid 1990s (before the advent of the internet), which then reaped handsome dividends. It also reflected a huge shift in Customs processes from volumetric controls (opening up every nth container for a random check) to risk-based administrative procedures, relying a lot on intelligence and checking algorithms to spot the potentially dodgy containers. UK Customs now opens the smallest proportion of containers for random checks of any country in the EU, yet without apparent quality declines. Success stories like this mean that centres of tenacious resistance to digital change in Whitehall’s highly conservative and massive bureaucracies have at last gradually crumbled and buckled. For instance, in a report for the NAO in 2009 we showed that the Department of Work and Pensions as late as 2008 conducted just 0.5 per cent of its customer transactions online, and had essentially ignored the development of the Web, even though more than half their ‘client’ were already online with Internet access by then. DWP now has a (challenging) target of achieving 80 per cent online transactions with its customers by 2015. These developments pose a fundamental challenge to commentators on the political right who have traditionally seen public services as inherently a swamp of over-manning and budget maximizing. For them it has been an article of faith that government productivity must either slide backwards or stagnate completely, at best growing minimally and way behind changes in the private sector. Much of the privatizing, outsourcing, ‘slim the state’ advocacy that still dominates Tea Party and neo-liberal rhetoric just becomes completely outdated in the face of a slimmed-down, capital intensive state, using cutting edge digital and knowledge technologies to achieve necessary collective goals. For the political centre-left, the new potential for productivity growth in government has both good news and bad news. The good news is that in parts of the state sector the previous ‘Baumol effect’ for the relative price of public services to rise every year can now perhaps be pushed back. State services need no longer get ineluctably more expensive every year relative to private goods – and hence taxpayer support for public services may be revived and more effectively sustained. The first part of the bad news though is that ‘big state’ strategies for improving social equality via expanding public employment are no longer viable. In advanced countries, especially those with sever austerity pressures, government sector jobs will begin to shrink appreciably. Yet there is evidence that the old social democratic strategies have not worked to increase social equality when government sector productivity lags that in the private sector. Alternative strategies, such as growing national prosperity and improving the equalizing effects of the welfare state, are now far more promising pathways to boosting substantive equality. The second part of the bad news might seem to be for government services that inherently rely on a human presence and service interaction, like healthcare, social work, much policing, or emergency services. Surely in these inherently labour-intensive areas the tendency for public services to become ever more expensive with every passing year cannot be evaded? Or perhaps new technologies can be injected into public services (as with online tax forms) only by ‘commodifying’ and ‘productizing’ them in ways that move them towards a Ryanair model of unpleasantly minimalist and uncaring service-providers, instead of the responsive ‘John Lewis’ state that most citizens demand. There is anyway a huge risk potential from quality declines in this area, as the Francis report on Mid Staffs hospital makes clear. In fact, without imperilling the core of most human service interactions in the government sector, there is huge scope for supplementary productivity enhancements to occur in these areas too, so long as implementation is carefully done. As the current ‘second wave’ of digital changes begins to move IT technologies from the margins of such services to reshape their essential design then simple and long overdue changes can offer substantial savings, like getting rid of the tenaciously defended mountains of dysfunctional paperwork in the NHS. Beyond this elementary level though, the growth of social media is already pioneering new, more community-based methods for radically improving information provision and responsiveness in online public services. We can say with confidence that the processes of re-envisaging services for the digital era has only just begun, but its potential could be huge – as perhaps the slightly frenzied current debates around Massive Open Online Courses (MOOCs) in higher education indicates. Larry Summers remarked aptly of all such service changes, especially digital ones: ‘Things take longer to happen than you think they will, and then happen faster than you thought they could’. Click here for details of how to access a podcast of the authors discussing their new book. Patrick Dunleavy is Professor of Political Science and Public Policy in the Government Department at the London School of Economics. Leandro Carrera is Senior Researcher at the Pensions Policy Institute. Their joint book on Growing the Productivity of Government Services has just been published by Edward Elgar.